Founded in 1993 by Melinie diLuck, Happy Tails Pet Sanctuary stands as Sacramento, California's first no-kill, non-profit animal rescue. Happy Tails focuses their efforts on "helping those who can't help themselves," and in the last 17 years they have successfully stuck to this motto. Since its inception, Happy Tails has rescued more than 15,000 homeless cats, dogs and other companion animals in the Sacramento Area. Run by over 200 dedicated volunteers and a small Board of Directors, Happy Tails Pet Sanctuary takes on a smorgasbord of ambitious activities. These include managing feral cat colonies, encouraging and practicing Trap-Neuter-Return (TNR), rescuing, sheltering and adopting out many cats and some dogs, and providing veterinary care to all rescued animals. Moreover, Happy Tails helps disabled, elderly, homeless and low-income families care for their pets and organizes many exciting fundraising and animal-welfare events in the Sacramento Area. DiLuck's inspiration to start Happy Tails stems from an eye-opening writing assignment she took on as a freelance writer in the early 1990s. To acquire more material for her article on "throwaway pets," diLuck visited a cat colony living along the American River. When several cats walked up to her, diLuck soon regretted that she had arrived empty handed. But she never came back to that place empty handed again. DiLuck, along with her husband and some friends, began feeding, trapping and fixing the cats. They started taking some of the friendly cats into foster-care and from there began the search to find them loving, forever homes. Recently, in October 2009, Happy Tails moved from their 800 square feet adoption center into the new and improved 3400 square feet Patricia L. Holmes Adoption Center. With seven cage-free cat enclosures, it is nothing short of kitty paradise. Each cat enclosure includes everything a cat could ever wish for: scratching posts, cat beds, cat stands and, of course, plenty of toys. The cats are able to roam about freely, with ample space to stretch, run, relax and play. "Like any animal, four-legged or two-legged, being caged is a stressful situation," says Board Member, Cathryn Rakich. 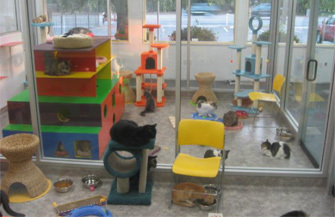 This open environment eliminates the anxiety and restlessness facing felines that live in confinement. The few felines that can absolutely not tolerate other cats are transferred to foster homes or smaller enclosures in the adoption center. Living in a cage-free environment is not only advantageous to the cats, but also to the adopters. Adopters are welcome into the enclosures and can witness firsthand the cats' true personalities emerge. "Are they shy, skittish, playful? Do they like other cats or would they prefer to keep to themselves? Are they lap cats? Do they like to be held? None of these things can be determined when a cat is kept in cage," says Rakich. Having gained this valuable information, adopters can be sure that they choose the cat that they have always desired. Currently, there are several cats up for adoption. Happy Tails also offers a reduced adoption fee for seniors. 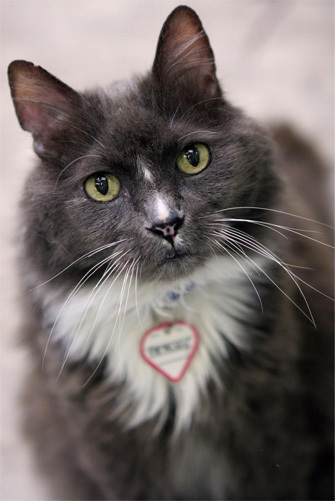 In the fall of 2003, Happy Tails Pet Sanctuary launched a major TNR program directed at a long-standing feral cat colony in danger in the Sacramento Area. Nowadays, Happy Tails volunteers feed and TNR two local colonies and generously assist the public with TNR. In doing so, they help to naturally and humanely reduce the number of community cats in the Sacramento area. "We have found TNR to be very successful at managing colonies," says Rakich. "We wish more people would embrace it as the most humane way to stop the cycle of unwanted cats in our communities." Happy Tails has also been able to care for a limited number of cats who have had to retire from feral colonies for various reasons. They are now living in an area called Catnip Gardens. Managed entirely by volunteers, the Catnip Gardens consists of two outdoor patios connected to two inside rooms. Felines get free range of both indoor and outdoor territory. Many cats, after residing at the Catnip Gardens for an extended period of time, become tame enough to move into the main adoption center where they get the opportunity to be adopted into loving homes. "It's a huge team effort, but we are committed to helping feral cats, as well as domestic cats live long, healthy lives," says Rakich. Happy Tails Pet Sanctuary hosts numerous fundraising and animal welfare events throughout the year. Their signature event, however, is Painting for Paws. The event features an art show, silent auction, and food and wine tasting. But the stars of this art show aren't humans - they are the cats and dogs themselves! Using non-toxic, water-based paints, the cats and dogs of Happy Tails create original masterpieces with their own paws and tails. "The paintings are matted and framed, and we feature them at our annual art show, each with a bio of the furry artist," says Rakich. At the 2009 annual Painting for Paws, Happy Tails showcased 51 paintings of their beloved animals and the event proved to be a huge success. So don't ever doubt the talent of your furry friends; they may just be waiting to unleash their inner artist. Happy Tails Pet Sanctuary extends aid to every cat, whether they are sick or healthy, injured or unscathed, feral or domesticated. Because of their non-discriminatory helping hand, Happy Tails incurs large veterinary costs each month and depends on generous donations to keep on doing what they're doing. Happy Tails also understands that everyone deserves to be able to provide a good, long life for their pet whether they are rich or poor, young or old, healthy or sick. That's why Happy Tails started the Helping Paw Program several years ago. Funds from this program help provide the necessary veterinary care for pets of seniors, disabled, homeless and low-income families. Nonetheless, Happy Tails struggles to give assistance to all families in need during these tough economic times. Every year the need exceeds the funding, so donations to the program are always graciously appreciated. Donate to Happy Tails Pet Sanctuary by clicking here. Take a look at their wish list to see if you can provide Happy Tails with anything they need right now. Learn more about Happy Tails Pet Sanctuary.